UNITED NATIONS, Mar 25 2015 (IPS) - At a recent panel discussion on women’s leadership during the U.N. Commission on the Status of Women, Ambassador Anwarul Chowdhury was the lone male voice. In front of an audience of every creed, colour and culture, the decorated diplomat and former president of the United Nations Security Council tied the advancement of women’s causes to one of his pet causes: the idea of ‘global citizenship,’ of humans growing and learning and acting and working with consideration of their place in the global community. “Being globally connected, emerging as global citizens, will help women achieve equality and help them show leadership,” Chowdhury told the packed room on Mar. 17. 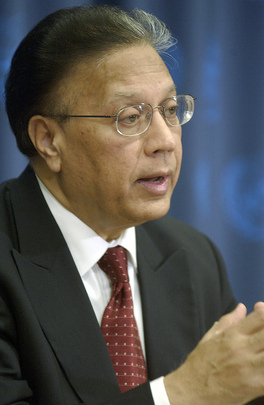 Through decades in diplomacy, the Bangladesh-born Chowdhury has served in some of the U.N’s highest posts, including under-secretary-general and High Representative for Least Developed Countries, president of the United Nations Children’s Fund UNICEF and vice-president of the Economic and Social Council, as well as serving two terms as Security Council president. This idea of global citizenship is one he has proudly championed, pushing for greater education for young people to know and appreciate their place in the world, and how they can understand global challenges. Chowdhury said the concept had existed for some time, but gained international prominence when it was enshrined – alongside increasing school enrolment and improving quality of education – as one of three priorities on the Secretary-General’s ‘Global Education First Initiative’ (GEFI) in 2012. “Global citizenship is your ability and capacity to think as part one broad humanity. It is believing in ‘oneness’ of humanity, that we are all connected and interconnected, all interdependent,” Chowdhury told IPS. Placing global citizenship alongside such foundational educational aspirations as increasing numbers of children attending school, and raising the quality of those schools, illustrates the extent to which the U.N. supports the concept. In contrast to the concrete, empirical first and second goal, a brochure produced in conjunction with the launch of the GEFI outlined global citizenship as a more esoteric, ethereal concept; concerned not so much with achieving a certain statistic or milestone, but with bringing about a more fundamental shift in how education itself is delivered. “Interconnected global challenges call for far-reaching changes in how we think and act for the dignity of fellow human beings. It is not enough for education to produce individuals who can read, write and count. Education must be transformative and bring shared values to life,” the brochure stated. The value of education is in learning to be part of a bigger world. Chowdhury cited economic development, climate change and peace as the three major challenges that require advanced global citizenship to find a solution. “Nobody can just get a normal degree from a university and think that knowledge will carry them through. They have to know what’s happening in the rest of the world. We have a better world if we feel for others in need who are impoverished and going through challenges,” he said. In his presentation to the CSW panel, Chowdhury invoked women in Africa – who he said “faced the heaviest odds in the world on many fronts” – as a source of inspiration for women worldwide fighting for gender equality. “I am personally encouraged to see the leadership of African women. They face heavy odds, but come up with enormous amounts of energy, creativity and leadership to make their presence felt,” he said. In speaking with IPS, he invoked global citizenship as a basic cornerstone for effective leadership moving toward a sustainable international future – but said that some foundational aspects of current education would need to be remoulded to achieve the ideal learning system to craft successful global citizens. “Sometimes people in industrialised countries think they know everything, that their education is the best, but in many cases those students have the least knowledge of the challenges in other parts of the world. The majority of the world’s population are going through concerns not even known to people in other parts of the world,” Chowdhury said. Both Chowdhury and the GEFI cited numerous barriers to implementing better systems to teach global citizenship, including outdated teaching methods and equipment, insufficient teacher capacity to teach such concepts, and the costs of updating or reforming such systems. “Reviews from around the world find that today’s curricula and textbooks often reinforce stereotypes, exacerbate social divisions, and foster fear and resentment of other groups or nationalities. Rarely are curricula developed through a participatory process that embraces excluded and marginalized groups,” the GEFI brochure stated. Chowdhury, however, stressed that the costs of inaction far outweighed the costs and difficulty of reforming educational systems. “We have ignored global citizenship and interconnectedness, valued independence of our countries, and conflict is happening. Economic development, trade regimes, all these things are are seriously affected if we don’t [change],” he said.